All these things are asked from Aubrey(Ninjas) and David. Also i have been making this list in case of no need for new forum posts about rules. Read the rules before asking questions the answer might be in the list already. Limbo = separate pile for coins which fills up everytime a player dies. 1. Draw three cards from the Town deck (on the right side of the board), and place them above the deck in the outlined spaces. These cards indicate the items that are for sale in the Town. 2. Each player chooses a colored figure and places it on the town square at the bottom-right corner of the board. 3. Each player rolls a die to see who moves first. In the case of a tie, the tied players roll again. 4. The first player rolls two dice, chooses ONE of them, and then moves clockwise one square for each dot that is facing up on that die. 5. The player then follows the instructions printed on that square. 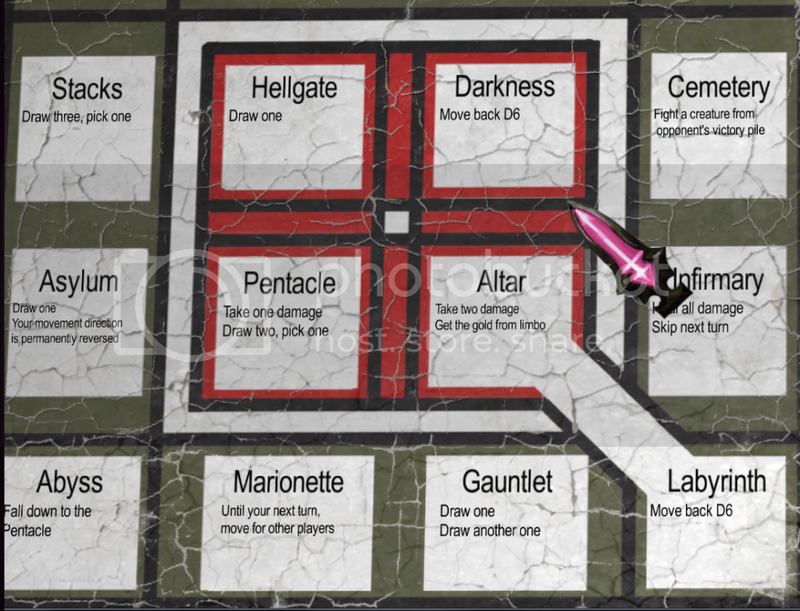 If the square requires drawing a card, the player draws from the deck corresponding to the depth he or she has reached in the dungeon. the red area(hell/dungeon 3) uses the orange deck. 6. To get to the lower levels of area you can choose to move down from kennel tile over the bridge to the Guillotine(Dungeon 2) and from the labyrinth to the altar(hell/dungeon 3). You may also move up from these areas in same manner. 7. If the player draws a monster card, the monster can be defeated by rolling a die greater than or equal to the die shown on the card. If it is defeated, the player collects the number of silver coins shown on the card, and places the card in the victory pile (shown with a skull on the player's inventory area). Otherwise, the player loses one hit point, and the monster is placed at the bottom of the deck from which it was drawn. If the player dies, all gold in the player's inventory is lost, and the player returns to the town to heal. 8. Repeat for every player, until all monsters are defeated. At that point, the players look through their victory piles to total up their victory points (the values shown in the skulls of their defeated enemies). Whoever has the most is the winner! 9. When you draw cards from any deck you put them picture side up on the board, so everyone can see the cards. 10. If you die in a battle you respawn in the town and lose all your coins.All lost coins go to a separate pile making 'Limbo' pile. 1. When players move past the Town, they may choose to stop at the Town instead. 2. When players move past each other, either of them may choose to initiate combat. In combat, each player rolls one die as if fighting a monster, and can use equipment as usual. Whoever rolls lower takes one damage. In case of a tie, both players take one damage. Repeat until one player is killed! The winner takes the defeated player's coins. 3. Alternately, when players move past each other, they may decide to trade equipment, coins, or defeated enemies. 4. Gold coins are worth 5 silver coins. All references to X units of coins, gold, or silver, refer to silver coins -- the gold coins are there for convenience when players have a lot of coins. 5. In Town, players recover all hit points, and may pay to buy any of the items shown in the store. Alternately, they can pay one coin to put those three cards at the bottom of the deck, and draw three new ones. Players may only carry three equipment items at any given time, but can sell items back to the store for half their purchase value, rounded down. 7. If a monster deck runs out of cards, you must draw from the next monster deck above it. If there is no monster deck above it, draw from the monster deck below it. For example, if Dungeon Level 2 runs out of cards, draw from the Dungeon Level 1 deck. If there are no cards there either, draw from the Wilderness deck. If there are no cards there either, draw from the Dungeon Level 3 deck. 8. Players can't move back and forth across the bridge. once crossed the bridge you must go around the area before you can go over the bridge again. 1. When item or defeated monster is discarded/used/eaten/stolen it goes in the another pile making a Discard pile. 2. All Location cards such as Secure Stronghold, Spirited Shrine, Quaking Magma and Furious Runes goes in your defeated monsters pile once used. 3. If player quits in a middle of a game permanetly you have to discard all his cards and put all his money in the Limbo. 4. When a tile or card says "opponent's choice" all your opponents can discuss which card they choose if they can't decide they may roll a die. 5. When an item is bought from the shop another item takes it's place from the town deck. 6. If you fight an enemy from an opponent's victory pile and lose, the monster returns back in the opponent's victory pile, or if you win the fight the card goes in your victory pile. 7. When you are asked to draw 1 card from the town deck, draw 1 and put it in your inventory picture side up. a.k.a Free equipment. 9. If both players get the same dice result in fight, both players take 1 hitpoint. If both players die result to this both player's money goes in the limbo pile. 10. You can buy as many cards as you can from the town in 1 turn. 11. You can use any equipment once per roll and any time during a duel. 1. Marionette tile effect is that you can move you can move your opponents in their turn. Opponent himself does the choosing and fighting part. 2. Every turn in the swamp, you can either pay 1 hitpoint or try to roll doubles. If the roll is doubles, you move, if the roll is not doubles, you fight. After paying 1 hitpoint for swamp you can roll the die normally for moving. 4. In cemetery you can't take location/castle cards from opponent's deteated pile. 5. In gauntlet if you lose to the first monster you don't need to fight the second one. 6. You can buy items from town when you arrive or before you throw the dice, both works. 7. In mirror you can swap places with any opponent you want, but still you have to do the what the tile says once swapped. 8. If you land on Tall Trees and you end up fighting Curious Slug, and manage to lose, your turn skips gets stacked. a.k.a if you roll 5 and 4 well you go 9 tiles foward only this turn. 10. Only way to obtain money from Limbo tile is to pay 2 health points on the Altar tile. 1. Players cannot send Serene Way back to the deck if they have only one hitpoint left. 3. Determined Explorer "and get an extra attack die in your next battle" means "in your next battle you roll both dies and the damage you do is sum of the result. 4. Wary helmet and Nervous boots effects are basicly the same(not standardized) except boots are more durable, These items work automatically. 5. Following cards are considered as a Spell cards. these are the only spell cards which are in the game. 6. If you fight against your opponent because of Lost Wanderer's effect, it is still to the DEATH! 7. Alarmed knight "On loss" effect deals 3 damage instead of 4 (he's a badass) the 4 on a card is a misprint. 8. If you win against Dominated baghead and die because of it's "On win" effect the baghead card goes in your defeated enemies pile and you have to throw all your money in the Limbo pile. 9. Unflinching Sword effect is passive, all your attacks have +1 result, like you roll 4 it becomes as 5 and if you get less than wanted number you can reroll 2 times. 10. If you have 2 Unflinching swords in your inventory their effects stack. 11. After you win a fight against the Lonely Birdman you roll 1 dice to see does the card go in your Victory pile. if you roll 5 or more the birdman goes back to the bottom of the deck. 12. Items as wary helmet don't work on Event cards such as Quaking magma. 13. Furious runes goes in your victory pile instantly. You roll a die for you each equipment, you discard the equipment item if you roll below 4 if it is over 4 you keep it. 14. If Receptive spell roll fails it just breaks the spell and gets discarded, but still designated spell is protected. In case if you have something to ask about be sure to post it in the comments section so i can ask that from the devs and give you the proper answer. I will update this list as i get hold of some more rules and fixes. Last edited by Saedz on Thu Jul 11, 2013 5:53 am, edited 29 times in total. How many items can be purchased at a time at the town? Can buying and selling happen in the same turn? When a effect says "Draw from town" does that mean the item is immediately placed in that player's inventory? When purchasing items from town, are those items supposed to be replaced with new ones from the town deck on purchase, when all 3 items are purchased, or only when a player pays 1 silver coin? If the area the active player lands in has no monster deck left, does the active player simply not draw monsters in that area, or do they draw from the next deck down that has cards? Well the inventory limit is 3 so you can buy 3 items at most also depends how much money you have. Players may only carry three equipment items at any given time, but can sell items back to the store for half their purchase value, rounded down. Yes the item goes directly to your inventory. When the any of the areas don't have any monster cards left that area is safe to walk on, you don't get any encounters from that area. Does the effects of items stack? For example: If you have two Unflinching Sword, do you get +2 to every attack and 4x rerolls? If you have three item cards and something makes you gain another (monster or location), what happens? If you fight an enemy from an opponent's victory pile and lose, does that monster return to the deck or to the victory pile of the opponent? ... or do you decide if you wan't to do one of the above? B) You get to decide do you replace another card with it or not draw at all. Excatly you get to decide which one you do. These updated rules need to come with the game. I've been treating the Altar tile like this: If you die because of that tile, you get to keep the gold you had instead of losing it like you usually would. There was no separate limbo gold pile. Maybe I'll try treating it the "official" way to see if it adds more excitement to the game. I love how you can change the rules and none of them are enforced by a computer. InhaleTheFlames wrote: These updated rules need to come with the game. Yes, it would be really cool if this list gets in the game OR with the game in a .txt file i would be really glad, but there is the thing that i have to make updates in the rules almost everyday. Also there is more card coming up sometime in the future and some balancing so some rules might change a lot. Hi i got questions, synpathetic shadow monster send you to darkness on loss, so you have to do whats on darkness localitation? if is so, were to move? red square section doing circles? which way is the right? amanoh wrote: Hi i got questions, synpathetic shadow monster send you to darkness on loss, so you have to do whats on darkness localitation? if is so, were to move? red square section doing circles? which way is the right? Also when you land on Darkness it makes you to "Move back D6" which means roll 1 die and move Counter-clockwise according to the result for rest of the turn. Hello, I have a question about the Rapids and Lonely Birdman, the Rapids says "You may take one damage to move forward 2D6 spaces." and the Lonely Birdman says "On win: On 1D6 5+ Lonely Birdman is returned to the deck." What exactly do those mean? Wheatt wrote: Hello, I have a question about the Rapids and Lonely Birdman, the Rapids says "You may take one damage to move forward 2D6 spaces." and the Lonely Birdman says "On win: On 1D6 5+ Lonely Birdman is returned to the deck." What exactly do those mean? Lonely Birdman says "On win: On 1D6 5+ Lonely Birdman is returned to the deck." this is more of a suggestion than a question about rule, so those goes in the in this viewtopic.php?f=18&t=17011 thread. If you fight birdman, win, and then get 5 or 6 so he's sent back to the monster deck, do you still get the coins from the battle?